-indices the value of the card on each corner. -double ended;2 heads on each card. – the modern pack has patterned backs. The above innovations were all for gambling purposes. 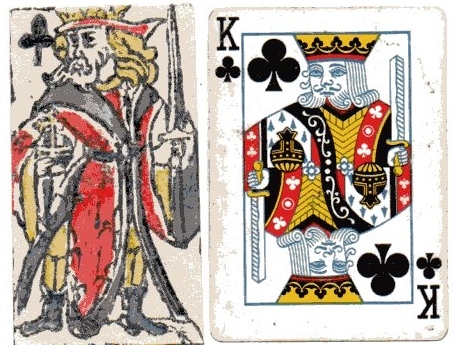 Without these designs, potentially an opponent could guess your hand; for example if you turned a card to see the suit, the other players could conclude that you were holding a court card. The other main change, not shown here, was the addition of the Joker. Unlike the changes above, he was introduced for a particular game. Was the Joker derived from the Fool of the Tarot pack? Possibly yes, because the Americans of the 19th century who made this change could have been familiar with the Tarocco packs used by Spanish and Italian settlers. However it’s unlikely that this type of southern European card pack was ever used in Britain, prior to these packs becoming popular for fortune telling purposes, in the late Victorian age.